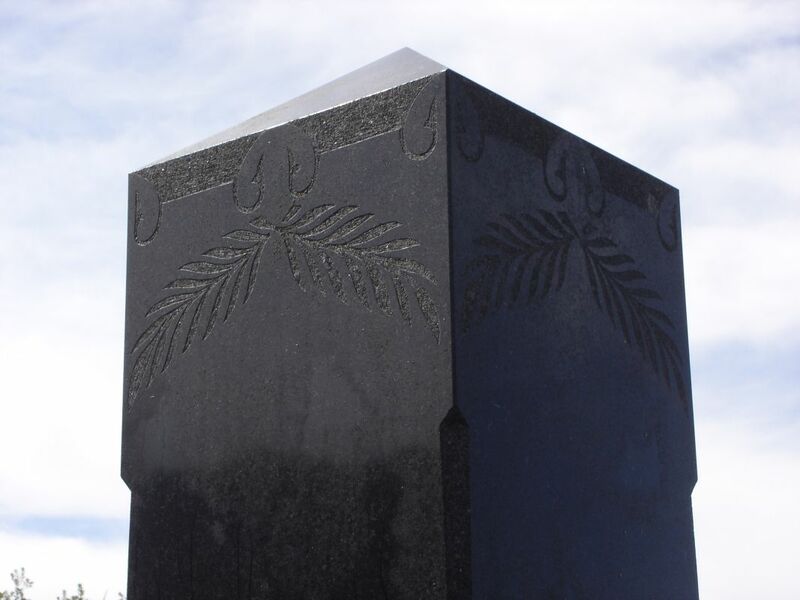 Being the dedicated cemetery trawler and avid genealogist that I am, my then partner and I happened upon a grave in a local cemetery not far from where we live and were particularly drawn to it for some reason. It was terribly covered in lichen and almost unreadable...it was a challenge to work out what his name was when we first found the grave. His name was Adam George BEGG. 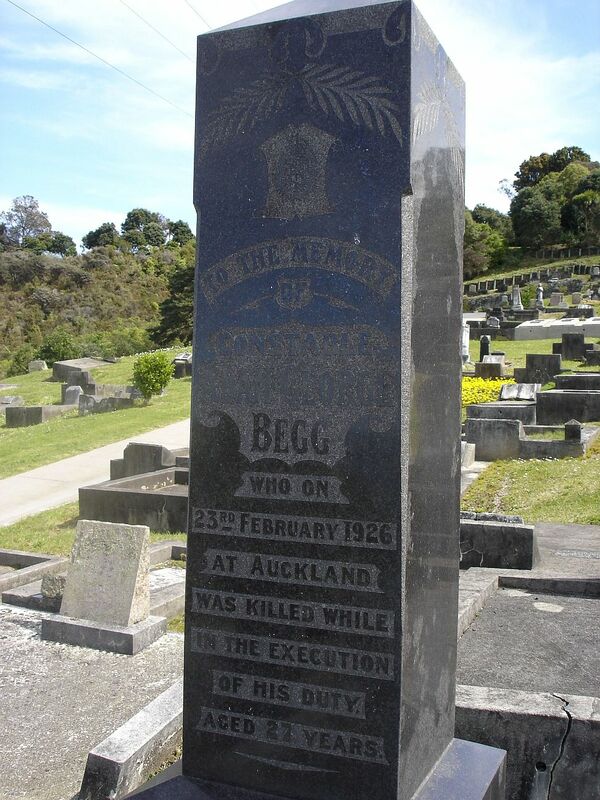 We have been caring and tending to the grave of Constable Adam George Begg, killed in the execution of duty on 23 February 1926 aged 27 in Auckland. 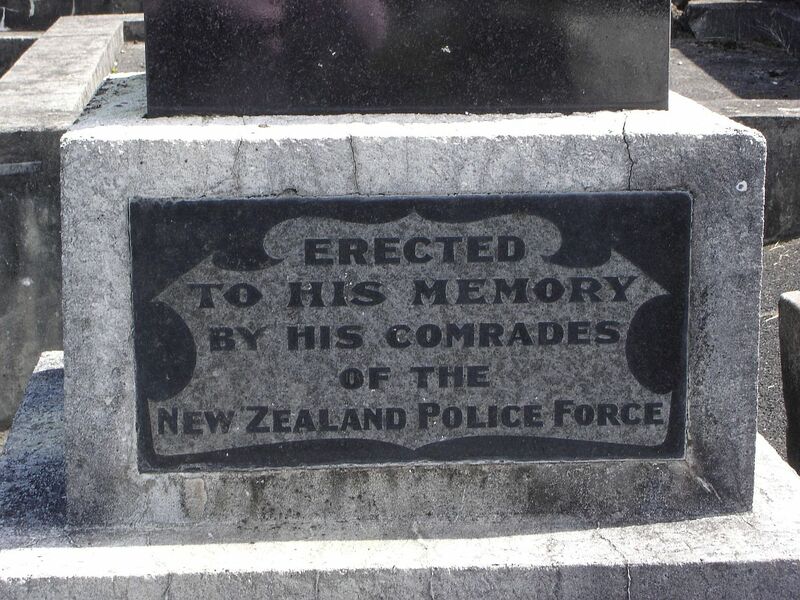 I had been hunting high and low for information on Adam and how he came to his demise as he did not appear on the NZ Police website listing those killed in the line of duty. I decided in the end to contact the Police Museum in Wellington who kindly emailed me back to say Adam had been hit by a train in the Parnell Tunnel on the chase of a criminal. How sad...he had died doing his duty and hadn't been memorialised. This was on our mind over several weeks, then out of the blue on 11 August 2008 came an email from Superintendant Gail Gibson of the Executive and Ministerial support, NZ Police who was responding on behalf of the Police Commissioner. She stated that the Police Museum had passed on my email to them and that the Commissioner is considering how we remember those members of police who have died on duty as a result of accidents, as we remember those slain by criminal acts. Now, today [27 June 2009] care of paperspast via the National Library of New Zealand website I have found an article from the Truth dated Thursday 4th March 1926 outlining what happened to Constable Begg...I feel even more passionate about securing a place in New Zealand police history for this young fellow who came out from Scotland just a few months before dying. This reinforces he did indeed die in the line of duty. Constable Adam George Begg who id as the result of injuries received in the Newmarket Tunnel [sic] yesterday, is to be accorded a police funeral. This will take place on Sunday next. the cortege will move off from the central police station at 3 p.m. for the Hillsboro' Cemetery, where the interment will take place. the Auckland Highland Pipe Band will be in attendance. Large crowds assembled yesterday to witness the funeral of Constable Adam George Begg, who was killed in Parnell tunnel by a passing train, while searching for an escaped prisoner. All along the route crowds stood with bared heads as the cortege passed by. A typical Highland lament was played by a pipe band marching in front of the hearse. Constable Begg only arrived from Scotland a few months ago. The coffin was covered by the Union Jack. The hearse was followed by nearly 200 members of the police force, including the detective branch. Amongst those present were Superintendent Wohlmann, ex-Superintendents Hendry and Sheehan, Inspector Mcllveney, Sub-Inspector Lewin and Chief Detective Cummings. The service at the grave was by the Rev. F. R. Jeffreys, who said that in this tragedy the public was brought face to face with the dangers that daily beset the members of the force at the call of duty. He only hoped that this sad tragedy would help the general public to a better understanding of its great indebtedness to our "men in blue, who, in season and out of season, unflinchingly faced many dangers of which those outside know nothing. While citizens sleep in security and peace, their homes and hearths, their children, their childrens' honour, was under the constant guard, day and night, of the men who, often with their lives in their own hands and throughout the long night watches, kept ceaseless vigil. Adam George Begg was only on the threshold of his career, but already he had given good service in Scotland, where for two years he had been a member of the Hussars and for five years a member of the Glasgow Police. He had been connected with the New Zealand Force for six months only and yet during that time he had won the affection and esteem of his comrades and the confidence of his officers, a record of which any man might well be proud. When his last call for earthly duty came he was asleep, having been out all night on duty. An urgent call at the watch house and Constable Begg. among seven others, was called from his sleep at eleven o'clock. He obeyed with the greatest alacrity and within two hours he had met his death. Far from his home, his kith and kin, far away in this outpost of his own country, his ready response to the call of duty resulted in his untimely end. 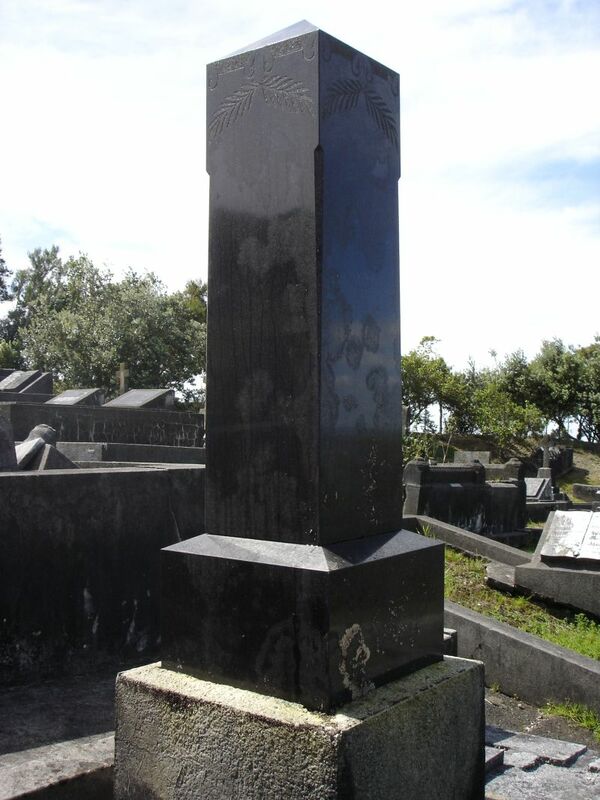 Cause of death: died at Auckland Hospital from Central Police Station, Auckland through injuries received through being accidentally knocked by a passing train in the Parnell railway tunnel whilst in the execution of duty. The same month I also emailed the police in Strathclyde, Scotland after searching on the internet indicated this would be the best contact for finding out more about Adam's earlier history as a policeman. My email was forwarded onto the Glasgow City archives as Strathclyde did not hold the very early records. Glasgow City Archivist then sent me 3 options for 20 year old policemen who were born in 1899 named Adam George Begg. I've yet to purchase the information however the newspaper articles fill this in a bit better for me. I spoke to a representative of Parkinsons [memorial firm] and they came back with the following details. Thank you for contacting us regarding restorative work on the memorial (in the Hillsborough Cemetery), for Constable Adam George Begg. on the top (and is part of the design). Although the plasterwork is pitted we do not consider that the plaster needs replacing as it is still solid. Replastering is a big job as all the old plaster would have to be removed otherwise the new plaster will not stay on for long. Nor would we advise patching the broken corners, for the same reason, however our following advice of a cement wash, will go some way to repairing these. Quotation - We advise giving the entire plasterwork a clean and cement wash. This will smooth out the surface of the old plaster. We will also supply and install the missing marble piece of framework and supply and fill with new white chips. Our Quotation - $1200.00 includes GST @12.5%. As of 27 September 2013 i've still heard nothing back from the then Police Commissioner Howard Broad [4 April 2006 - 3 April 2011] nor his successor Peter Marshall [4 April 2011 - incumbent]. Adam still goes unrecognised for dying in the line of duty because he wasn't killed 'by the hand' of a criminal. After my hand in the success of having Sapper Robert Hislop, the first New Zealand soldier to die in WWI formally recognised, I've got stuck back in to doing something about Adam again. In a last ditch attempt, I wrote to Peter Hayes, the Manager of Welfare Services for the NZ Police Association after being forwarded the Letters page of their magazine, issue Jan/Feb 2014 by a contact. In this, it was noted that the situation relating to officers killed on duty and like Adam's not slain by a criminal but still dying whilst on duty was being investigated. This involves at least 712 police members. It appears there may be positive outcomes in relation to at least 50 of these individuals, I was ecstatic to read this! "Police are currently undergoing a research programme where they are endeavouring to identify all those Police Officers that have died on duty but not necessarily by a criminal act. They've already identified BEGG as one of those officers and in due course Police will be formally recognising those Police Officers in some way. The historical records that Police have indicated he had no family living in New Zealand. If you are a relative could you please confirm your relationship? I have forwarded your email with blog details over to Police to assist with their research. Of course I'm not a relative however I do get very attached to those I research. We consider him almost part of the family now! I sent Peter all I have gathered so that they may attempt to find a familial connection back in Scotland. It's nearly a year since my last update. In that time I have discovered that Adam called up for the Scots Guards on 17 April 1918. Service number 17635. Vaccinations in childhood and also revaccinated. Marks: Mole 3 inches inside left [illegible]; Mole 1/2 inch in front R. angles lower jaw. Papilloma both sides back of neck. Next of kin: Charles BEGG, Drumneachie, Birse, Aberdeenshire [brother]. Drumneachie is where Adams home address is also given on demobilisation. On demobilisation transferred to "Z" class Army. He served 338 days in the Army. Protection Certificate and Certificate of Identity in with military records for 20 days furlough stamped 21 February 1919 at No1 Disposal unit, Kinross. Special remarks: Clean, honest and sober; a reliable man, was promoted L. Cpl for good service. When my then partner and I went to Wellington last weekend to attend the 100th commemorations at Pukeahu of the Battle of Chunuk Bair, we also decided to pop in and have a look at the Police museum. It is very small but very interesting. I left a note in the visitors book stating I was still waiting to hear what is to happen about Adam Begg, not really expecting to get any feed back and yesterday I did! Rowan Carroll the Director of the Museum contacted me. Today i've learnt that Adam will be included in the accidental deaths on duty recognition at this year’s Remembrance Day – 29 September! I am over the moon!!! It has taken 7 years but it has finally happened! As an aside - an interesting moment at the Police Museum when I was looking at the display relating to the Waihi Strike riot and the death of Frederick EVANS. 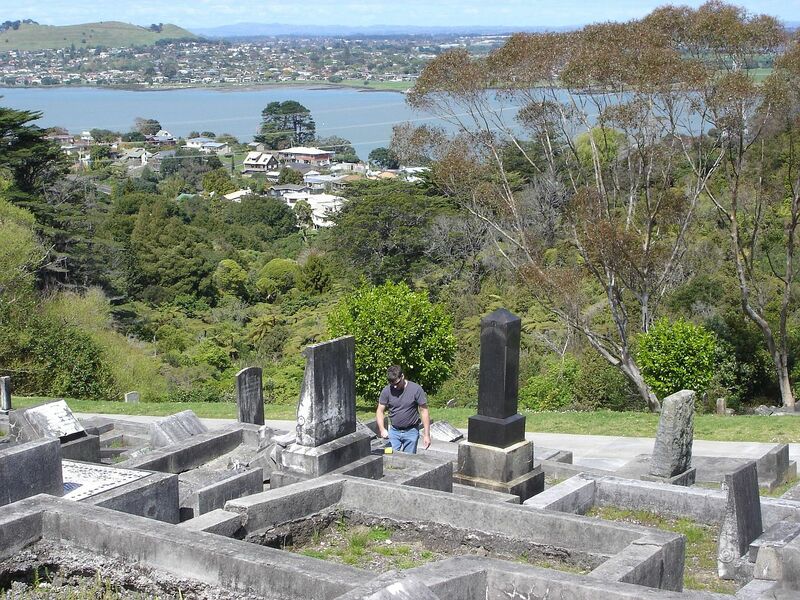 I recognised the large reproduction of Fred's grave photograph to be one that I had taken at Waikaraka Cemetery and had sent in to www.nznhistory.net.nz to use! I'm just amazed where my photographs are popping up. 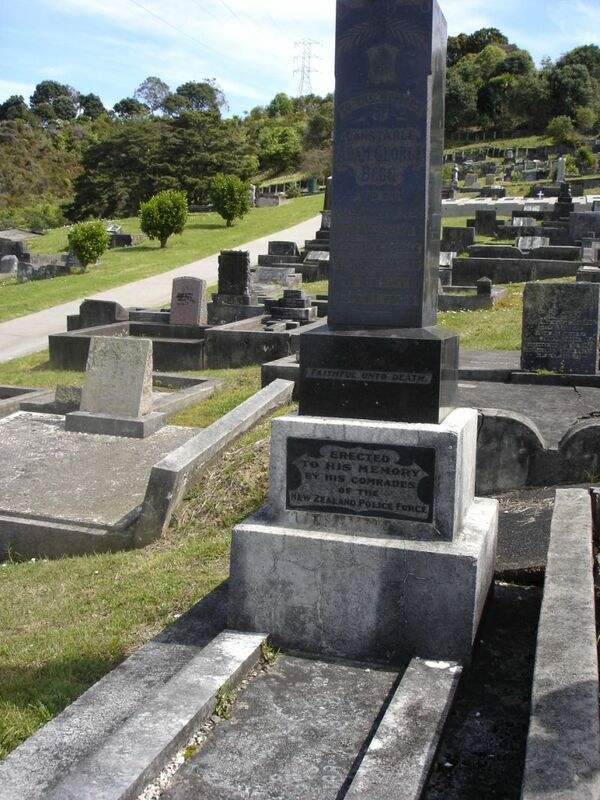 and Fred's story http://www.nzhistory.net.nz/people/fred-evans - he remains 1 of only 2 people killed during industrial disputes in New Zealand. Hearing Adam's name read out and seeing his name on screen at the service was a wonderful thing. My then partner and I felt extremely proud to represent Adam. The bagpipes were also played making the occasion especially poignant for this Scottish lad's first mention on Police Remembrance Day and to be remembered every year from now on. 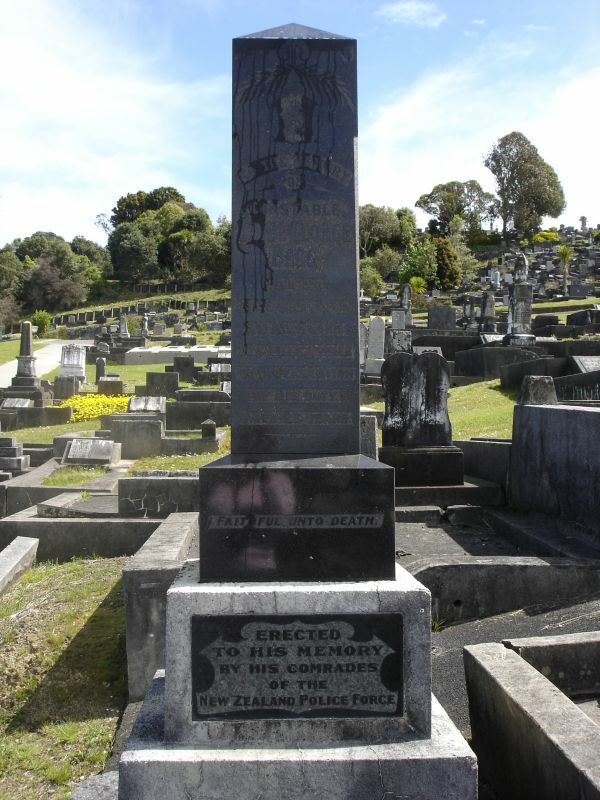 More photos of his grave at the bottom of the page and The New Zealand Truth's version of events is below.